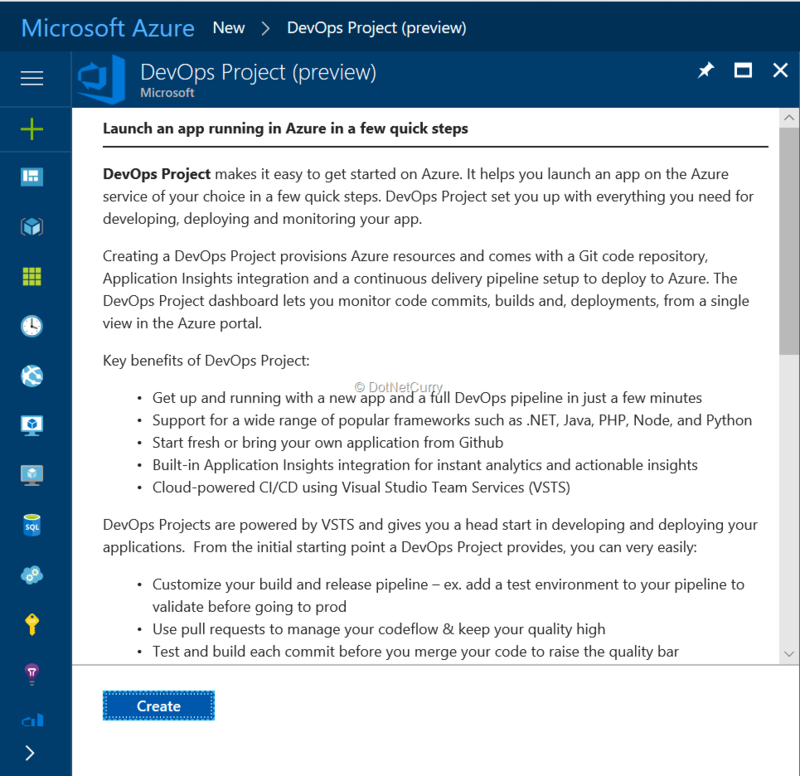 Microsoft has added a new service to Azure that supports DevOps teams to automate the CI / CD Pipeline creation. This service is called the DevOps Project. Creation of Team Project if it does not already exist. Creation of a source repository in the existing team project. Creation of a build definition that has a trigger for Continuous Integration. Creation of a release definition that has triggers for Continuous Deployment. Create initial code as per selected project type and add it to repository of version control. 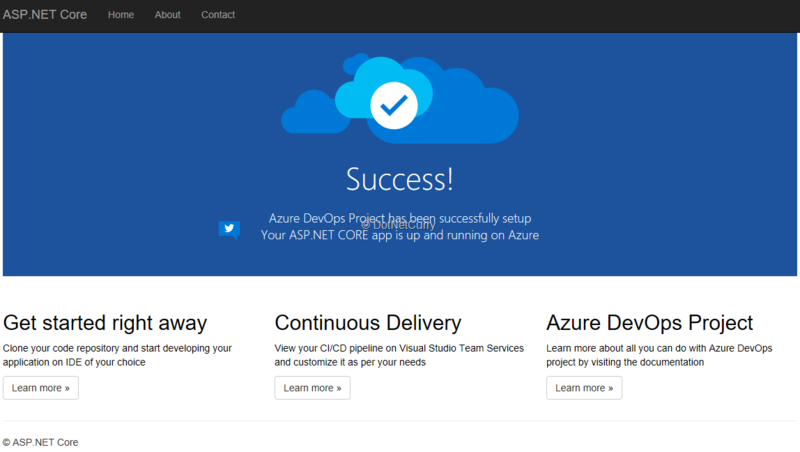 Create any additional Azure resources that may be necessary to support the CI / CD pipeline. In this article I am going to walk you through the steps of creating a DevOps Project so that all these automation steps are executed. I am going to take a case of an ASP.NET Core application that is deployed on an Azure App Service as a Web Application in the containers. 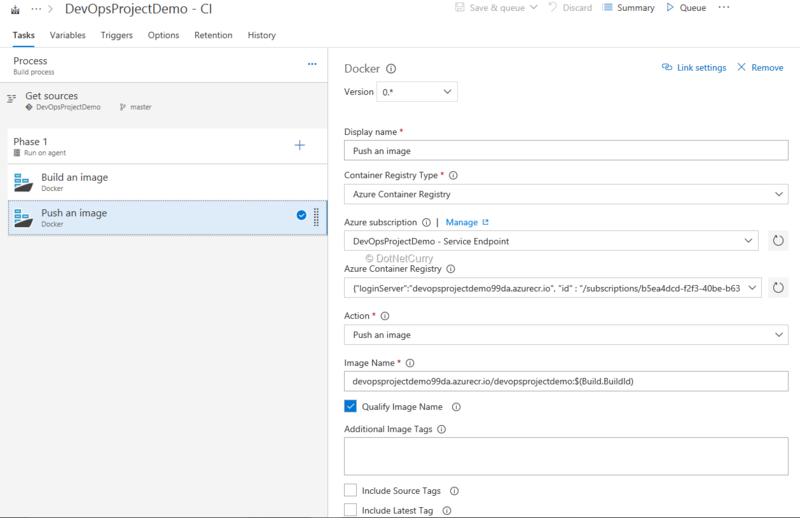 What you will get as an output is a CI / CD pipeline for this application, an image of the application that can be used by the container service, Azure Container Registry that will store this image and the Web Application on the Azure App Service. 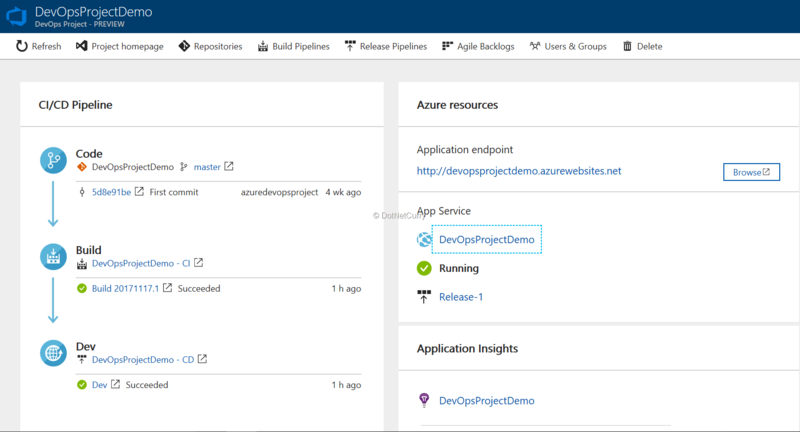 In the Azure portal, click the button for +New and in the search box, type in DevOps Project. Select the DevOps Project from the drop down that appears. Doing so starts a wizard to fetch the details for creation of DevOps project. Click on the Create button in this wizard. For this walkthrough, I have chosen to use an ASP.NET Core application that can be hosted in the containers. On the next page, we have to provide details of the VSTS and Azure subscription. 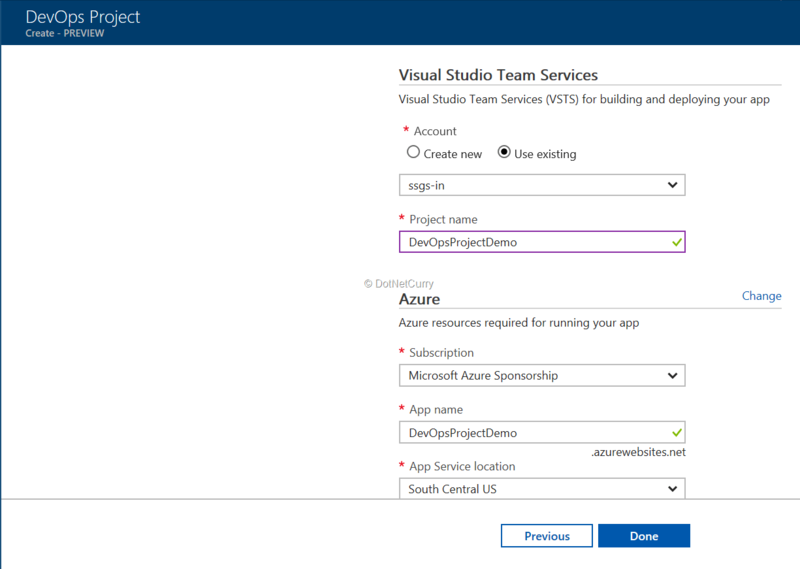 I have selected to use my existing VSTS and Azure subscriptions but have given a name of a team project which does not exist, so that it will be created. 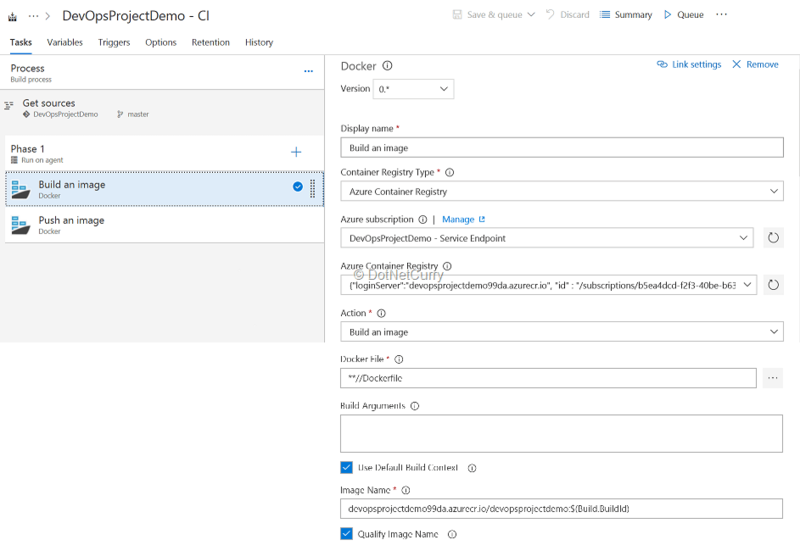 Once we click on the Done button, it starts the process of creating the Team Project, code, version control repository, build definition, release definition, Docker Image, Azure Container Registry, push the image to that registry, Azure App Service application with containers support and run that image on that app. It also adds the support of Application Insights to this application. After the wizard has completed processing all that, it sends out an email to confirm that application is deployed and running. 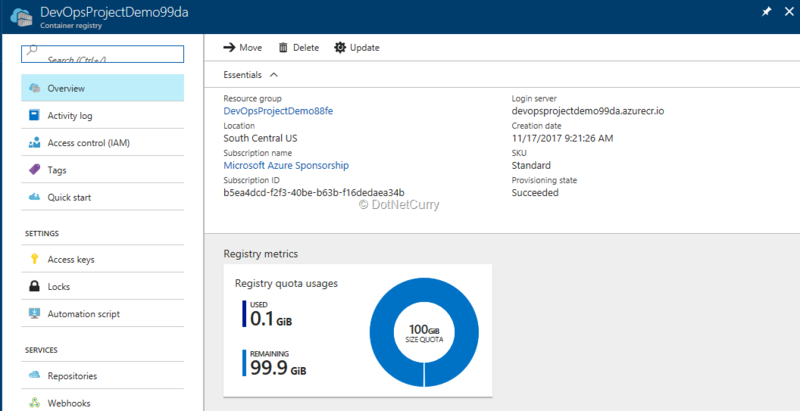 The page in the Azure portal shows all the artifacts the DevOps Project has created and also all the Azure resources created. We can see the code under version control of that team project. That build definition is configured to run on a Hosted Linux agent. It contains a task for building the image from the Docker file that is automatically created. The next task is to push that image to the created Azure Container Registry. 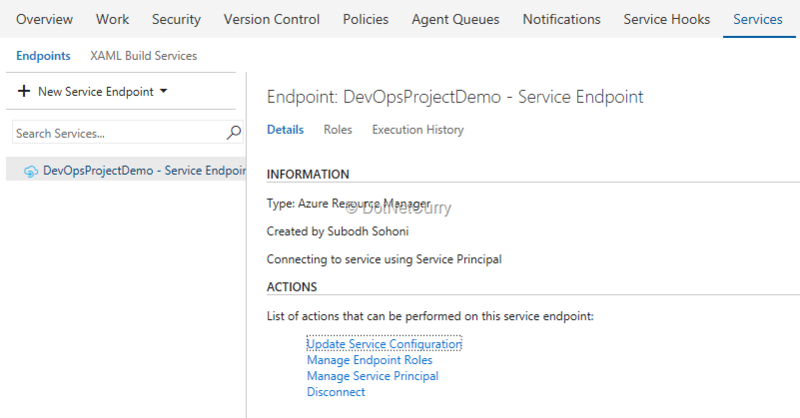 The connection to Azure is made by a service endpoint which is also created automatically. Let us now look at the created release definition. It contains the task for deployment of the app to the Azure App Service from Azure Container Registry. As part of the completed wizard, the build and release are automatically triggered. At the end of the deployment, the application is running and we can view it. At the end let us view the resources created by the wizard. 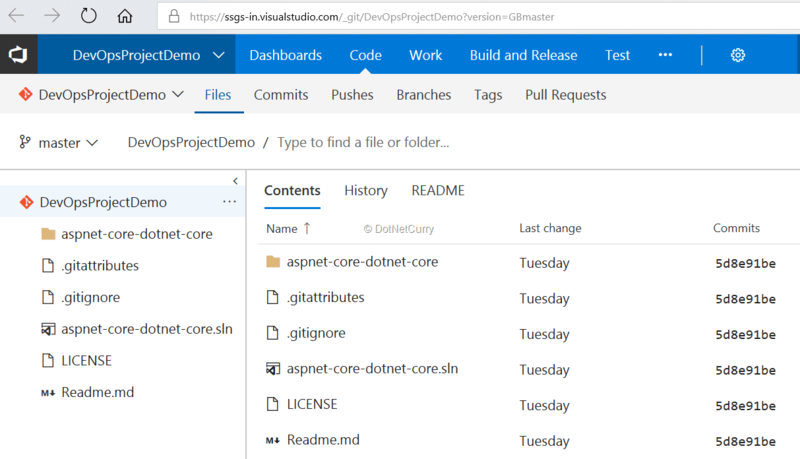 The first is the Azure App Service where the ASP.NET Core Application is deployed. We can also view the Azure Container Registry created by the wizard. 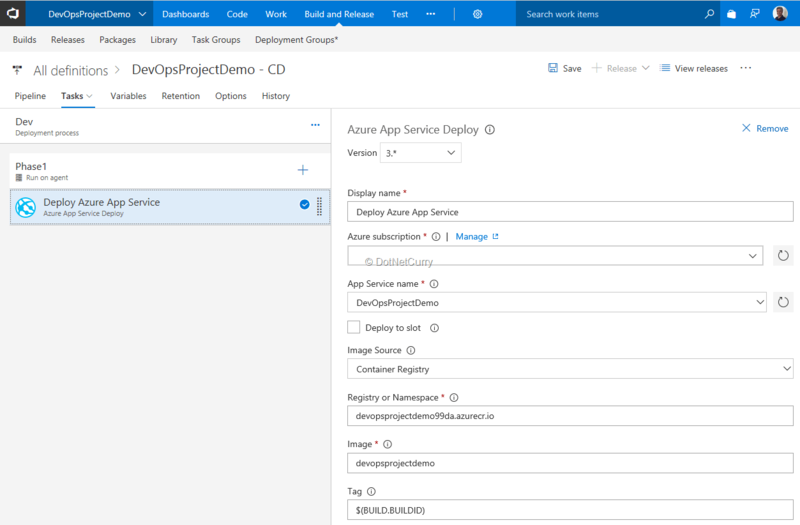 In this article, we took a walkthrough of the DevOps Project service of Azure to automatically create a CI / CD pipeline in VSTS for a containerized application.